Hidden deep in the wings of the auditorium stage at Lewis and Clark High School are two musical treasures that came to be because of extraordinary fundraising and a public-spirited principal with an Ivy League emphasis on the arts. First came a grand piano as a gift from the class of 1912. Later came a pipe organ. Lewis and Clark was built after a fire destroyed South Central High School in 1910. Principal Henry Hart, who served from 1906 to 1936, watched the fire consume much of the school’s books, photos and records. The fire’s cause was never determined. Former President Theodore Roosevelt placed the new cornerstone in 1911. The replacement high school building opened in 1912 and was renamed Lewis and Clark. Hart encouraged every senior class to raise money for a gift to the school. The class of 1912, the first to graduate from the new building, bought a Steinway 9-foot D model grand piano for the stage of the new school’s auditorium. The class paid $1,650 for it, which is roughly $42,000 in 2019 dollars. At well over 100 years old, it is still hard at work accompanying choirs and bands each year. If the piano were to be fully restored, it could command up to $95,000 on the used piano market, according to Faust Harrison Pianos, an upscale Steinway dealer in New York, which offers a handful of older Steinways. Hart, born in 1875 in Orange County, New York, attended Cornell University before coming west. Hart’s tenure at Lewis and Clark was marked by his love of classical art and music, and his Ivy League emphasis on academic achievement. In that same era, Hart raised money for a collection of photos, sculptures and paintings to decorate the new building, including two life-sized oil paintings of explorers Meriwether Lewis and William Clark that hang in the auditorium. After World War I as the school mourned the 20 LC students lost in battle, Hart challenged the senior class and the entire student body to pool their fundraising over several years for a suitable gift to memorialize the war dead from Spokane. This multi-year effort resulted in the installation of a pipe organ at the high school. In the 1910s and ’20s, high schools were an important part of a community’s social and cultural life. It wasn’t uncommon for community halls, dance halls and skating rinks to have pipe organs, although they were more frequently found back East and in Europe. The reason for their popularity was simple: Before amplification became available, it was one of the few instruments loud enough to entertain a large audience. In 1924, the school placed an order for a large, $26,000 pipe organ from the Austin Organ Co. of Hartford, Connecticut. Spokane organist James Wallrabenstein, current member American Guild of Organists called the the instrument an “orchestral” organ, with the pipes and voices that span church and theater organs, suitable for playing popular music, show tunes and dance music but without the drums and sound effects of a theater organ. The organ has four keyboards, called “manuals,” and 2,375 pipes arranged in 32 “ranks” that include square wood pipes, metal pipes and bells. It’s not the largest organ in Spokane, but close. The LC website says that when the organ was installed, it was the largest civic auditorium organ west of the Mississippi River. Today, the largest pipe organs in Spokane are at Our Lady of Lourdes (102 ranks, split between acoustic and digital sounds), the Cathedral of St. John the Evangelist (72 ranks), and First Presbyterian Church (64 ranks). During its first 50 years, the instrument was often used at assemblies and choral concerts. Organists from universities vied for time at the console for recitals and rehearsals. But organ music fell out of popularity and by the 1970s the instrument was rarely used. Still, music boosters persuaded the district to pay for the organ to be restored in 1979. Recordings from the 1979 rededication concert can be heard on the Spokane Public Schools website. When the school building was renovated in 1999 and 2000, the pipes were removed from the loft above the stage and stored at the Holley-Mason building, where the students went for classes during the construction. The console was completely updated with computerized controls and electronic connections. Vocal music teacher Jeffrey Boen said he was excited about the organ when he started started teaching at Lewis and Clark in 2017. He said he thought to himself, “They have an organ? Oh, I have to use it. Who else gets that opportunity in a high school setting?” Boen arranged for his choir to perform “Last Words of David,” for an October concert But when the organ was fired up for rehearsals, random notes would stick open and Ron Pearson and Kent Brocklebank of Northwest Organ had to make quick repairs. In the process, they noted extensive damage to the instrument from disuse. Leather gaskets, seals and bellows were deteriorating rapidly and cracking. Brocklebank said last week the low humidity of the Inland Northwest dries out and cracks the leather. “The worst thing you can do to a pipe organ is not play it regularly,” he said. Wallrabenstein said the local members of American Guild of Organists had an agreement with the school in 2002 to play the organ regularly and monitor the overall operation of it. But he said shortly after the agreement was made, the AGO members were discouraged by from using the auditorium by busy drama and music programs. 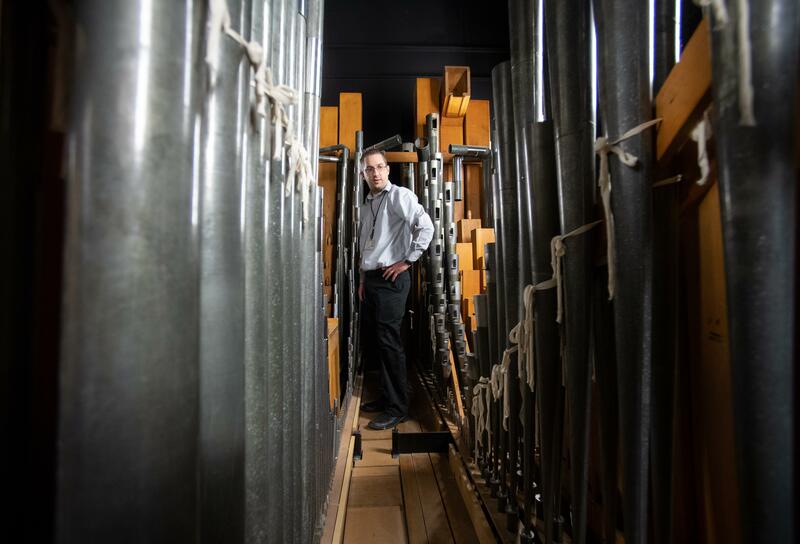 LC band teacher Daniel Nord, who has never used the organ, likes the idea of getting the organ repaired and commissioning new music for organ and band or orchestra. Meanwhile, accompanist Holly Haupt Porter, who plays for choirs at LC, says the Steinway piano still plays well, but with a slightly stiff key touch, and without the “ringy” sound that is typical of very old pianos. Henry M. Hart died in 1936, remembered for his fundraising prowess and enthusiasm. The arts weren’t his only passion, either. He helped raise $55,000 in the 1930s to purchase Hart Field, the sports complex where sports teams practice. Published: Feb. 10, 2019, midnight Updated: Feb. 10, 2019, 1:58 p.m.